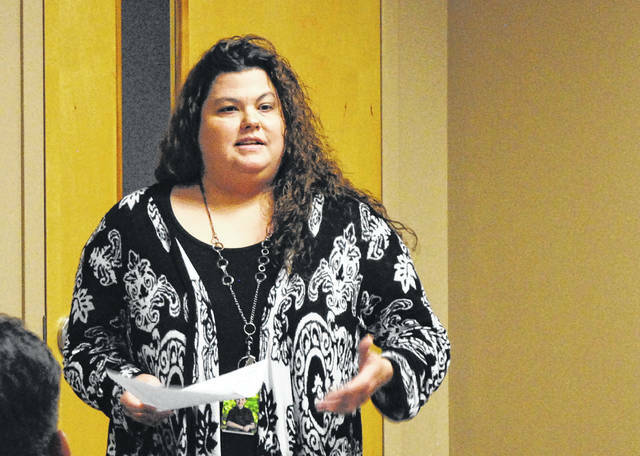 Monica Baucher, residential team leader at the Lynn Goff Clinic in Greenfield, speaks to the Highland County Drug Abuse Coalition on Thursday. Amanda Gragg told members of the Highland County Drug Abuse Prevention Coalition on Thursday that if it hadn’t been for the Lynn Goff Clinic, a women’s residential substance abuse treatment facility in Greenfield, she would be dead. Gragg and Nikkie Helton, two Highland County women currently in recovery from drug addiction, said the clinic was their last hope on a lonely road toward a shallow grave. Both had tried several times to kick drugs for good, but it wasn’t until they walked through the back door at the Lynn Goff Clinic that they were truly ready to recover. Helton said she, too, was on a destructive path until she found the Lynn Goff Clinic. “Lynn Goff is my lifesaver,” she said. The clinic, operated by Scioto Paint Valley Mental Health, opened earlier this year with 16 beds for female clients, according to Monica Baucher, the residential team leader at the clinic. Baucher told coalition members that nine women are currently staying at the clinic, including Helton. Gragg graduated several months ago. According to Baucher, Scioto Paint Valley counselors from Highland County and Ross County are on hand multiple times a week for individual and group sessions, implementing a holistic treatment method that addresses clients’ mental and physical health as much as addiction itself. “Lynn Goff treats the whole person,” Baucher said. Helton and Gragg said Lynn Goff staff gave them the tools they needed to cope with anxiety, depression and post-traumatic stress disorder, which in turn helped them understand their addiction and secure recovery. If necessary, Lynn Goff clients can take Vivitrol, a drug that stops cravings and blocks the effects of opioids and alcohol in the body for about a month. Clients also learn how to cook for themselves and write a budget, and attend regular community service events and Alcoholics Anonymous and/or Narcotics Anonymous sessions. Gragg said she continues to attend those meetings, and also volunteers at the clinic. In addition, clinic staff help clients develop a robust relapse prevention plan. Baucher said since the clinic opened, 50 women have come and gone, 13 having completed their 90-day programming. Sixteen of the clients checked themselves into the clinic, and 34 were court ordered to do so. According to Baucher, none of the clients who checked themselves into the clinic completed their programming. Baucher said court-ordered clients are more likely to complete the program because they know they have jail time hanging over their head if they don’t complete it. Since the clinic cannot legally hold clients against their will, even if they give permission, the women are free to come and go as they please, Baucher said. But that doesn’t mean clinic staff can’t try talking them out of it. Sometimes it works, Baucher said, and sometimes it doesn’t. Gragg and Helton both said they doubted they would have completed the program if they hadn’t been under court orders to do so. To Gragg, the Lynn Goff Clinic is much more than a treatment program or a comfortable place to stay. It’s where she got her life back. “This is one of the best things Highland County has got,” she said. Baucher said the clinic accepts Medicaid and private insurance. It can be reached at 937-981-7701. Coalition President Gena Bates said the coalition will meet again Sept. 27 to hear from a representative from Massie House, a sober living facility in the Belfast area. This entry was tagged greenfield, highland county, Hillsboro. Bookmark the permalink.